Carter Hart is on his way to Philadelphia. It’s been six years since the Flyers last made the playoffs in consecutive seasons. It’s also been six years since the Flyers last won a playoff series. It’s been six months since the Flyers were torched by the Pittsburgh Penguins in the opening round of the Stanley Cup playoffs, limping off to the home applause of debris strewn all over the Wells Fargo Center ice. The Flyers would like to forget that—and may have a chance this season to begin a new winning chapter for this storied franchise that hasn’t won a Stanley Cup in 43 years. General manager Ron Hextall has certainly surrounded the prime pieces of the Flyers, Claude Giroux and Sean Couturier, who are coming off career years, with more solid players, with the return of James van Riemsdyk, and the continuing maturation of young players like Nolan Patrick and Travis Konecny. There appears to be a vitality with this group, an understated feeling that they are a playoff team playing for more than just making the playoffs this season. This is the season where Hextall’s grand scheme begins to merge. If the pieces come together a year before they should, the Flyers could be good enough to contend for the Metropolitan Division, which has produced the last three Stanley Cup champions in the Penguins’ consecutive cups and the defending champion Washington Capitals, who the Flyers were 3-1 against last year. The Flyers could go three lines deep. Mikhail Vorobyev, 21, had a great training camp and is an energy guy who seems to make good decisions with the puck. He’ll center the third line. Jake Voracek, like Giroux and Couturier, had a career year last season, and will be paired on the second line centered by Patrick, who scored eight goals and 17 points in his last 25 games. The reason for the optimism was the Flyers going 27-13-7 over their last 47 games, after beginning the season 15-13-7, and seemingly no direction. That’s when Flyers’ coach Dave Hakstol made the brilliant move of pairing defensemen Shayne Gostisbehere with rising star Ivan Provorov. “I think this team is similar to last year, but a little bit more advanced,” said NHL analyst Keith Jones, who also does color for local Flyers’ broadcasts. “I really like the way van Riemsdyk has looked and the way he carries himself. He’s obviously a much mature player than when he was here before. He has a certain air of confidence, which should boost the confidence of this team improving upon last year. “What Hextall wants is working. We saw guys like Konecny and Nolan Patrick emerge in the second half of last season. Those are probably the most encouraging things, the younger players emerging at a very rapid rate. Those players will be the difference makers in how far this club advances from what it did last year. “What you hope is that there is a real sour taste in the player’s mouths for how they went out last year against Pittsburgh. They were a closer team to Pittsburgh than how they represented themselves. You just have to hope that’s part of the growing experience against a club that won two-straight Stanley Cups. The players may not have realized how close they were. 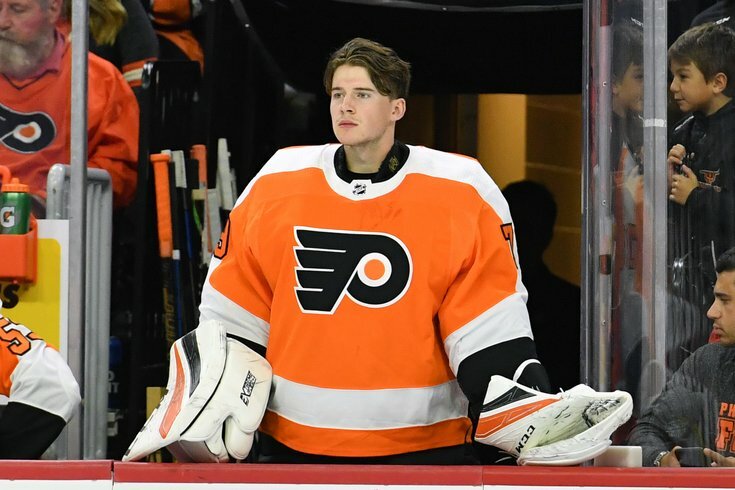 The gaping void that is missing comes in goal, where “bridge goalie” Brian Elliott keeps the crease warm for another season, possibly shorter, for future franchise goaltender Carter Hart. “This team needs to be consistent,” NHL analyst Jeremy Roenick said. “They lost 10-straight games last year and expected to make the playoffs. It’s an amazing year they had, and that provided a good lesson to make them gritty. If Carter is able to take the ball and run, you have to let the kid try it. I’m a huge believer in Hakstol. I like his attitude and how he’s stood behind his players. I like him, I really do. “I do have to correct something, though. People think the Flyers are taking their time. They’re not. They haven’t been taking their time. You saw last year. I’m sure you’re going to see more this year of what they’re getting out of the younger kids like Patrick, Konecny. It was a major statement that they got JVR back, which says the Flyers are trying to win right now. Elliott turned 33 in April and just finished his 12th NHL season. His body began breaking down last year, and he’s started this season off slowly recovering from more health issues. He may be chronologically 33, though once Elliott takes off his layers of pads, he looks worn out and 60, as if he’s played 33 years in the NHL. Right now, the Flyers have arguably the worst goalie tandem in the NHL. When healthy, Michal Neuvirth, a good “room guy,” has shown signs he can be special, when healthy. But he always seems to be one blown nose away from pulling a groin or suffering a strained tendon. At best, Elliott is average. In the last two seasons, he’s posted a .909 save percentage, and it didn’t help that the Flyers were 29th in the NHL on the penalty kill, allowing 54 power play goals on 223 power play opportunities (75.78 percent). The only thing keeping Hart at Lehigh Valley, where he’s starting the season, is his birth certificate. He was the best goalie during training camp and the only two-time CHL Goalie of the Year has shown the maturity to handle the pressure through his play in the back-to-back performances at the junior worlds. Hart, who turned 20 in August, is the hockey equivalent to the Eagles’ Carson Wentz and Sixers’ Ben Simmons. But Hextall wants to treat Hart with kid gloves right now. The Flyers best chance to win is Hart. No one in the Flyers’ locker room may openly admit it, but deep down, you have the sense that they feel it. Giroux, coming off a 34-goal, 68-assist, 102-point season last year, will turn 31 in January. Couturier will turn 26 in December. They want to win now rather than waste this prime years waiting for Hart to gestate in the AHL. “The Flyers have their Carson Wentz, and those guys are rare, and injuries may open up opportunities for him, and it’s just debatable whether or not what could be a bad experience is experience, where everything is fine, or does it set him back a bit if it doesn’t go well from the start?” Jones said. “I think that’s why teams are cautious, especially with goaltenders. What would be ideal is Hart comes up in November and Anthony Stolarz backs him up, or possibly Calvin Pickard, who the Flyers picked up after he was waived by the Toronto Maple Leafs after playing 33 games for the AHL’s Toronto Marlies last season. This is the transition season the Flyers have been waiting for towards serious contention. The pieces are certainly there. They just have to be put to use. Big bold prediction: The Flyers win the Metropolitan Division and win a round in the playoffs to lay the foundation for a big run in the 2019-20 season. Coach: David Hakstol (3 years: 122-86-38 regular season; 4-8 playoffs).